Joy Creek Photo Archive (c) all rights reserved Grow Cornus sanguinea 'Midwinter Fire' for the fiery stems that begin red at their bases and change to yellow and then orange at their tips. A rounded shrub with some fall color that is at its most beautiful at the end of the year. 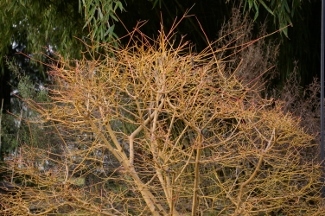 Cut back at the end of winter to promote new growth and to keep the shrub in size. Spring 6 ft. x 4 ft.